This is a 4-weeks Course starting from 30th March, 2019 at 10:00 am to 1:00 pm every Saturday and Sunday. Course Dates: 30th Mar, 31st Mar, 6th Apr, 7th Apr, 13th Apr, 14th Apr, 20th Apr and 21st Apr. Course Timings: 10:00 am to 1:00 pm every Saturday & Sunday. Special Discount of 40% (i.e., 6000/-) for students only. GitHub is a development platform inspired by the way you work. This Git course will be emphasizing on all the necessary skills which will take people from complete novice to expert using hands-on experience and interactive sessions. 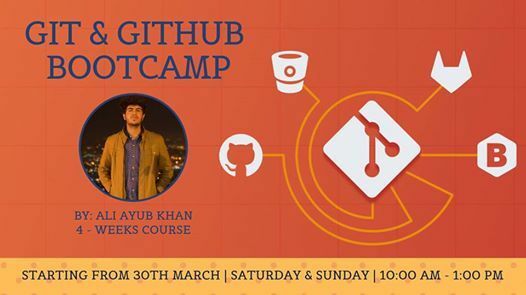 If you want to learn more about GitHub then this course is all you need. Ali Ayub Khan is a final year bachelor’s student of Computer Science at School of Electrical Engineering and Computer Science (SEECS), NUST, Islamabad, Pakistan. He was Google Summer of Code Intern at FOSSASIA for 2017, a program hosted and funded by Google Open source. Mentored students in Google Code-in and Google Summer of Code in 2017 and 2018 respectively. He is Pakistan’s first GitHub Campus Expert. Currently heading student chapter of an international society named ACM(Association for Computing Machinery) as a president. Working as a software developer intern at Neuropsychology lab, University of Oldenburg, Germany. He has been a Summer Exchange student to Beijing in 2016 and has won NUST Excellence Award. 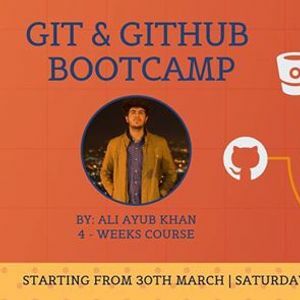 In this interactive course, participants will be given introduction to version control systems especially Git along with the complete usage of GitHub and they will acquire all the necessary techniques to ace their careers in Git & open source development. It will help IT leads understand how to manage the team and development. 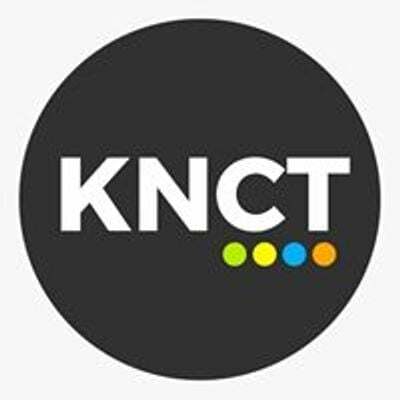 Developers will learn techniques about standing out and making themselves visible to world without any CV. --> Bonuses: How to be visible using GitHub and a complete cheat sheet with all commands related to each topic. --> Account formation and Installation on windows, MacOS & Linux. --> Initialisation and first commit. --> Tips and trick needed to be visible to market using GitHub. --> People should be searching you on Google instead of looking your CVs. --> A detailed cheat sheet with all the commands related each topic. --> Future association for mentorship.